A powdery butterfly found at the Fox Tree Top Path near Fox Valley. Attacks by launching powder at you. A mutated dark stump found in Twilight Perion, accessed from Henesys Ruins. It uses the same attacks as its weaker counterpart. Solitude that has manifested into the form of a burning sword. Found in Kritias's Forest of Laments. A bushy monster found at the Fox Tree Top Path near Fox Valley. Attacks by inhaling to inflate its body. A mutated stump with an axe on its head found in Twilight Perion, accessed from Henesys Ruins. It uses the same attacks as its weaker counterparts, except this one can also spit out a fireball, which is slow enough to dodge. A mutated Wild Boar found in Twilight Perion, accessed from Henesys Ruins. 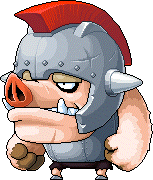 It uses the same attacks as the Mutant Ribbon Pig, except the punch attack will only hit you once instead of 6 times. A bushy monster found at the Fox Tree Side Path near Fox Valley. Attacks by inhaling to inflate its body. A mutated Iron Boar found in Twilight Perion, accessed from Henesys Ruins. 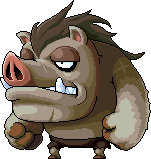 It uses the same attacks as the Mutant Ribbon Pig, except the punch attack will only hit you once instead of 6 times. Interestingly, it turns into an Iron Hog when it dies. Terror that has manifested into the form of burning nunchuks. Found in Kritias's Forest of Laments. A squirrel storing seeds in its mouth. Found at the Fox Tree Lower Path near Fox Valley. Attacks by making its Venus Flytrap-like tail chomp at you. 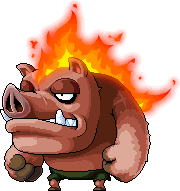 A mutated Fire Boar found in Twilight Perion, accessed from Henesys Ruins. It uses the same attacks as the Mutant Ribbon Pig, except the punch attack will only hit you once instead of 6 times, and it can also throw a ball of fire towards you. A mutated Wooden Mask found in Twilight Perion, accessed from Henesys Ruins. It can breathe out fire and stomp the ground. A mutated Rocky Mask found in Twilight Perion, accessed from Henesys Ruins. It can breathe out fire and stomp the ground. 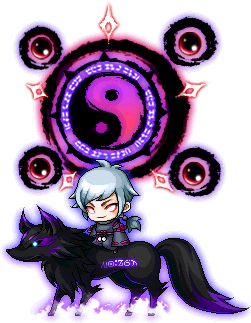 Mori Ranmaru has now gone insane. You must defeat him to prevent him from performing a ritual. He has 5 forms, all with the same stats, except the last form, which gives experience. It now has a skill similar to Arkarium's Screen Crash, which it uses at 10% HP. Rage that has manifested into the form of a burning hammer. Found in Kritias's Forest of Laments. A small bird found at the Fox Tree Midway, when climbing up the tree into the clouds. Attacks by turning into a monstrous dinosaur-like creature and charging into you. Stjartmes is Swedish for titmouse, a real bird. A mutated Steel Mask found in Twilight Perion, accessed from Henesys Ruins. It can breathe out fire, stomp the ground, and cast a buff in which non-critical attacks will miss. Surprisingly, it does not exist in present-day Perion. 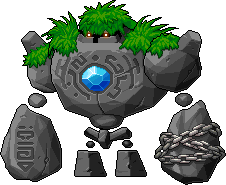 A mutated Stone Golem found in Twilight Perion, accessed from Henesys Ruins. It can raise its Weapon Attack and raise the damage that you deal on it. It attacks by smashing its arms into the ground, and by dropping 3 rocks onto you. A mutated Dark Stone Golem found in Twilight Perion, accessed from Henesys Ruins. It can raise its Weapon Attack and raise the damage that you deal on it. It attacks by smashing its arms into the ground, and by dropping 3 rocks onto you. Anxiety that has manifested into the form of a burning bow. Found in Kritias's Forest of Laments. One of the Fox God's guardians, found Beyond the Clouds near Fox Valley. Attacks by using its cane to create thunder clouds. 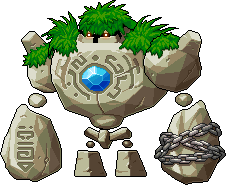 A mutated Mixed Golem found in Twilight Perion, accessed from Henesys Ruins. It can raise its Weapon Attack and raise the damage that you deal on it. It attacks by smashing its arms into the ground, and by dropping 3 rocks onto you. A squid found in Twisted Aqua Road. It's basically a stronger version of a Squid from regular Aqua Road. Vanity that has manifested into the form of a burning staff. Found in Kritias's Forest of Laments. A magician found in Kritias's Corrupted Magic Forest 1, accessed from Forest of Pain 4. Attacks by firing magic at you. An enhanced android found the Scrapyard of Edelstein. Does not have any attacks, but it runs very fast. A minion of the newest commander of the Black Mage, Lucid. Must be defeated for a quest related to Twilight Perion. A spirit of happiness, formed in Arcane River, a dimension where the Black Mage was able to merge Maple World, Grandis, and FriendStory. Found at the Vanishing Journey's Lake of Oblivion, an area which requires 30 Arcane Power to deal full damage. Attacks by bouncing on you. 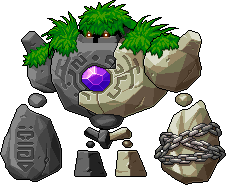 The boss monster of Twilight Perion, accessed from Henesys Ruins. It can stomp the ground and breathe out long ranged purple fire, both of which hit 5 times, which can only be avoided by going behind it or far away, making this dangerous for lower HP classes. 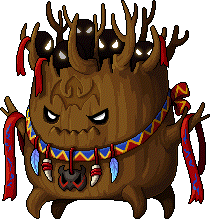 Ghostwood Stumpy can heal itself and nearby stumps by 8,000,000. One of the Fox God's strongest guardians, found Beyond the Clouds near Fox Valley. 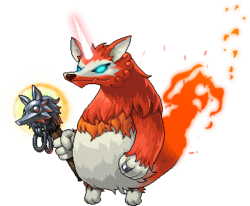 Attacks by using its cane to create ghostly foxes to run at you, brush dust onto you, and create thunder clouds. Summoned by the Inferno Onmyouji. The only way to defeat it is to have a Phantom cast Vol D'Ame near it to steal its invincibility. This page was last edited on 17 March 2018, at 15:49.